FILM REVIEW | Everything Will Be: How do you know when you’ve fallen off a horse? Screening July 29, 2015 organized by Vancouver Asian Film Festival, followed by panel discussion with Olivia Cheung, Doris Chow and Studio 126. The panel was moderated by Vincent Wong. A security guard who has been patrolling Chinatown for 20 years is shown looking out the window of a second story office on Pender. Across the street, he has a glaring view of a neon sign installed on the Wing Sang Building. He reads the words aloud—“everything will be alright”—and contemplates the meaning with suspicion and levity. The neon text glows with shiny and suspicious sincerity, like something they might say right before one is put to sleep. Much like this neon by artist Martin Creed, Julia Kwan’s first foray into documentary filmmaking has generated polarizing results. But it would seem that the documentary is contentious not in its lack of sincerity, but in an absence of on-screen controversy. Since screening at the 2014 Vancouver International Film Festival last September, the majority of reviews have reflected positively on the film—a cinematographic success and a poetic portrait, or “time capsule” as it is referred to time and time again. But so far, the question of political accountability has been dodged. While the film shines a necessary spotlight on Chinatown, viewers must be wary of the nostalgic tone mixed with a problematic optimism for how the past gets fused with the future. Kwan substitutes a necessary politics in favor of a Chinatown that is beautifully anachronistic; a community that appears to be on the verge of surrendering to a future that may ultimately exclude them, but while keeping the flourishes of Chinese heritage. While Kwan has stated that it is merely “an observational, immersive documentary,” the film struggles to relinquish the element of control that comes with narrative filmmaking—the kind of filmmaking for which Kwan has been previously celebrated. The word and opinions she compiles play out in a tone of lament that seems to support the view that Chinatown is slipping imminently into obsolescence, indifferent to survival and passive in the face of change. As a shopkeeper is shown weighing, grinding, and packaging plants and herbs, her voiceover recites a Chinese proverb: when one falls off a horse, they continue by walking. A 90-year old newspaper vendor’s children have all moved to Victoria, but she refuses to join them out of fear of boredom, nothing to do, insisting she doesn’t want to be taken care of, boasting that her punch “could kill a tiger.” This moment is heartening, but it is also the type of portrait that feeds the presumption that everything seems alright, so it’s okay if we put a building here, demolish a building there, and everyone will just continue to walk. Here, the sentiment seems to bemoan the process of gentrification, but as Kwan stated to the Georgia Straight, “[the film] doesn’t really comment on that change, because you see it through the eyes of the people who live and work there—like sitting on a stoop in Chinatown and watching the world pass by.” Kwan adopted and paraphrased the neon text piece to reflect less optimism, and more of a Zen outlook. This equanimity “is more apt,” says Kwan, “because it conveys a Zen simplicity and acceptance that reflects the view of some elders in the community.” It is an imbalanced portrait she paints, where no real and existent tensions are flared, nor acknowledged. The gentrification strategy in this area has always banked on a stereotype of “zen” passiveness—but so too, it seems, does Kwan’s film. A small but relatively meagre effort is made to counter or subvert the impression of fading when Kwan portrays a young and optimistic artist who signs a one-year lease on a storefront which he converts into a public studio. With this figure, Kwan strives to illustrate that Chinatown is not necessarily forsaken by a younger generation. A similar gesture occurs with a series of shots showing The Keefer Bar, located at the bottom of a boutique hotel on Keefer and Columbia. The bar is shown hosting a burlesque night where the dancers perform against the backdrop of a window that faces the street, and serves cocktails with homage to traditional Chinese apothecary ingredients or rituals such as infusing it with frequencies symbolic of love. Based on these portraits, those who are interested in keeping Chinatown relevant seem to be either dreamy starving artists or trendy entrepreneurs. The narrative of gentrification dictates that one begets the other, so the process looks as if it is already well underway and there is nothing more to be done about it. There is an on-going concern that Chinatown is turning into a museum, but the star of the film is a definitive harbinger of it. While he collects the pieces of Chinatown as they crumble off its buildings, the systemic weathering of its infrastructure—and by extension its population and traditions—is no concern for Rennie so as long as he can display a piece of it as his contribution back to the community. The real-estate marketer appears to be aspiring to be a neighborhood man, perhaps a little like Daniel Lee, the security guard; one who walks into a shop and is greeted with warmth and trust by the community at-large. A shot of a framed photograph in Rennie’s office shows the marketer bumping fists with Hilda Lam of the recently-closed Ho Sun Hing printers. Kwan also depicts him striking a deal to purchase sets of Chinese lead type from the Ho Sun Hing Printers during the time of their liquidation sale. He expresses plans to display them in his museum, “Let’s keep Chinatown in Chinatown,” and adds that if it were up to him, he would put wrap Chinatown’s oldest print shop in a “plastic bag.” Although, it’s still a bit early to consider Chinatown a site for archeological excavation. After the screening there was a panel discussion where Doris Chow said that the nostalgic air of the film in fact needs to be dispelled, because it actually attracts “Bob Rennie types” who are strategizing based on the anticipation of its disappearance. Olivia Cheung of Treasure Green Tea Company commented that after the film premiered in September, she received a wave of concerned calls from her clientele who thought she was closing her shop, which is indeed still open. These responses to the film are testament to how it portrays the resilience of Chinatown’s merchants while simultaneously representing the community as weary or docile, at the end of a rope. Another panelist, the proprietors of Studio 126 (a reclaimed wood furniture showroom, studio and gallery) purported to be a new model for Chinatown merchants. They are a young family who operate with their children present in the shop and provide workshops—although, designer furniture cannot really be equated with the services and wares that are necessary to sustain Chinatown residents. 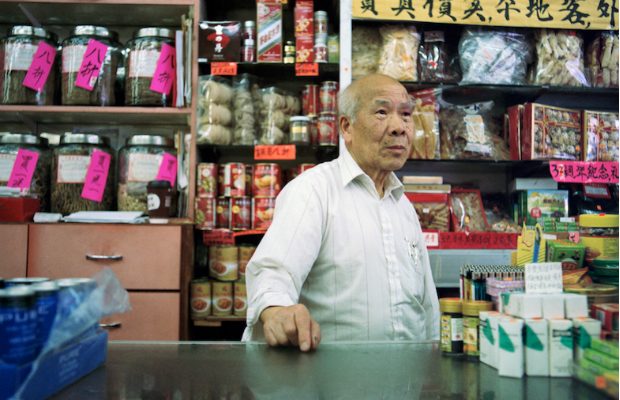 The significance of their contribution to the ecology of Chinatown remains to be seen. The act of “preservation” is turned over to external voices who seem sympathetic to the neighborhood, and by accident, or not, are found undermining or erasing forces within the Chinese community already working to prevent the pillaging of their cultural and physical property. A few short blocks away from the infamous neon sign is another piece of public text beneath a mural that depicts ancient philosopher and poet Laozi (or Lao Tsu). Beneath his figure, it reads in both Chinese and English, “It takes knowledge to understand others, but it needs a clear mind to know oneself. It takes strength to surpass others, but it requires a strong will to surpass oneself.” The passage beneath this mural, of Lao Tsu (ironically again, on a horse), advocates for self awareness before deploying knowledge, strength or even kindness towards others. 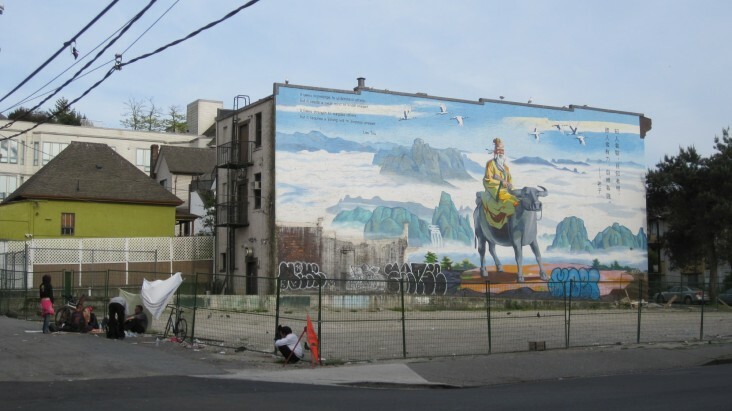 Earlier this year the Chinatown Concern Group, led by King-mong Chan, brought about 60 residents of Chinatown and 1,200 signatures on a petition to protest against the city’s latest plans for the neighborhood. Included in the grievances was a six-story building planned to go up at the corner of Gore and Pender, which would ironically block the Lao Tsu mural. The mural was unveiled in 2010 as part of Chinatown’s 125th Anniversary. Five years is all the city gives for a mural to commemorate a hundred and twenty-five. 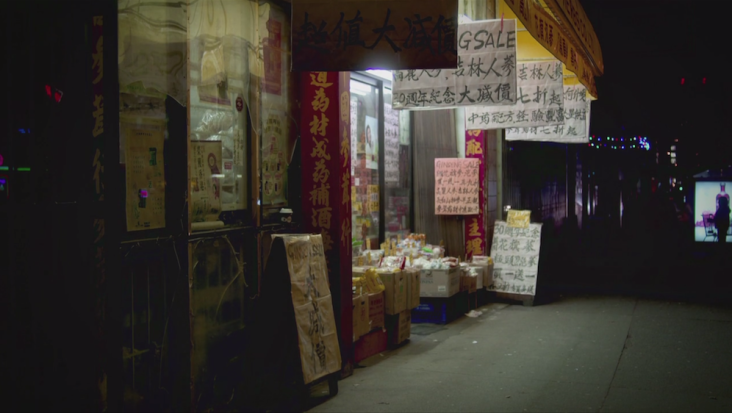 There is more to be said of this film’s lack of relationship to unseen realities in Chinatown. A driving force of the film is its tendency to aestheticize, or display a lack awareness towards, the politics and forces at work in the neighborhood it depicts. But this is a question of whether art, in this case, documentary cinema, gives, takes away, or does absolutely nothing for the people it address or takes as a subject. Another vexing addition to this discussion is the recently-installed sign, again a neon, on the corner of Pender and Hamilton by Victory Square. It reads “Let’s Heal The Divide” and is visible from Victory Square. The work is by Toni Latour and was commissioned by the Vancouver Biennial. Posted in Art & Culture, Chinatown. Bookmark the permalink.